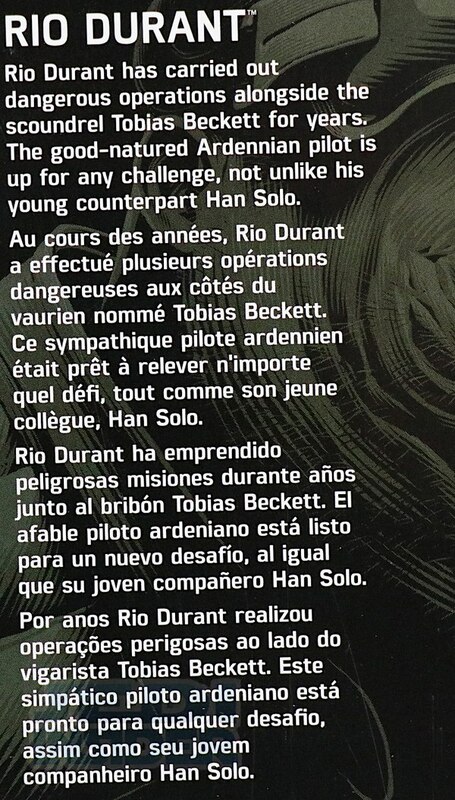 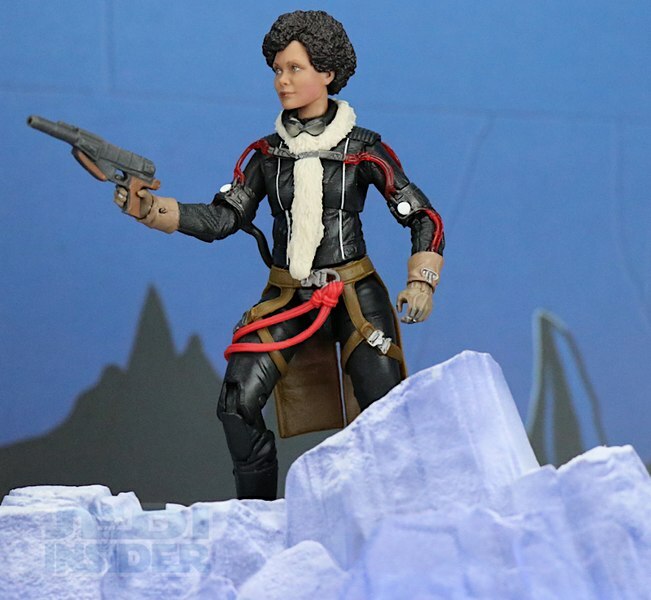 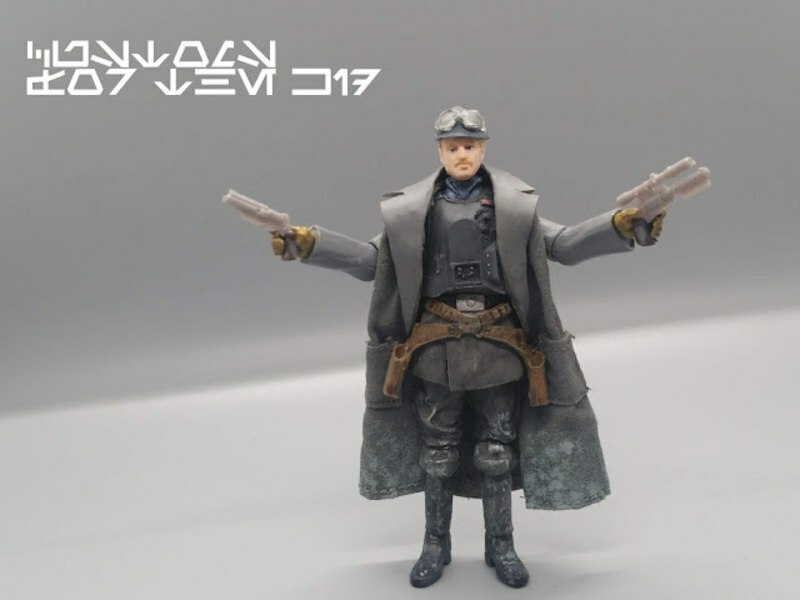 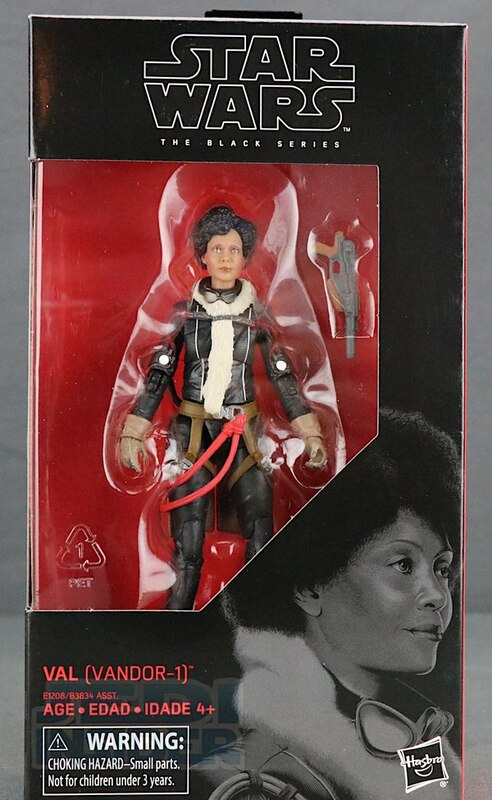 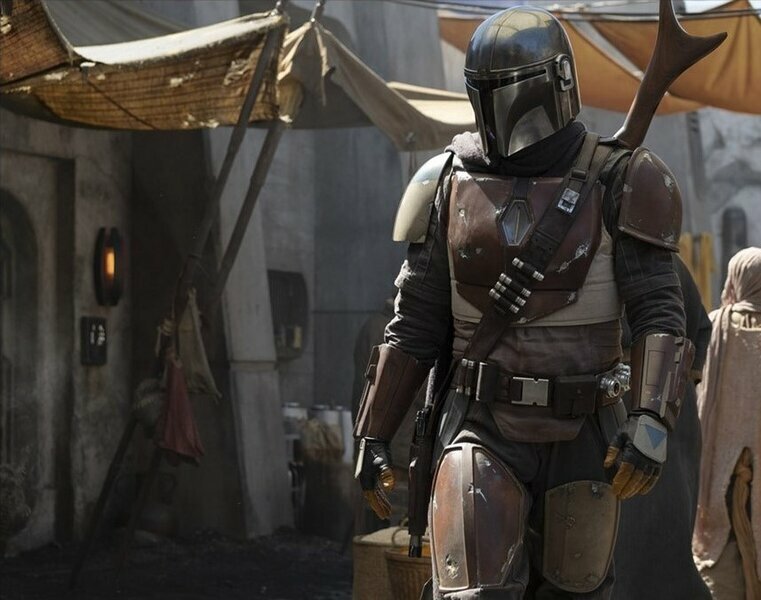 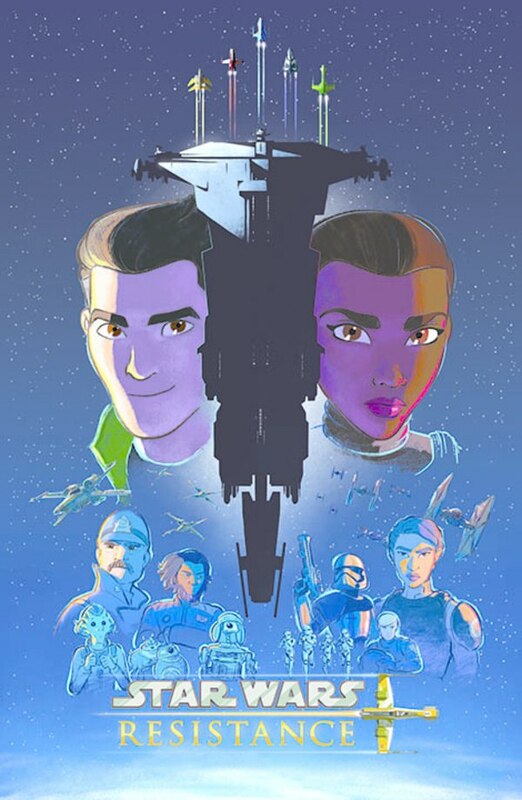 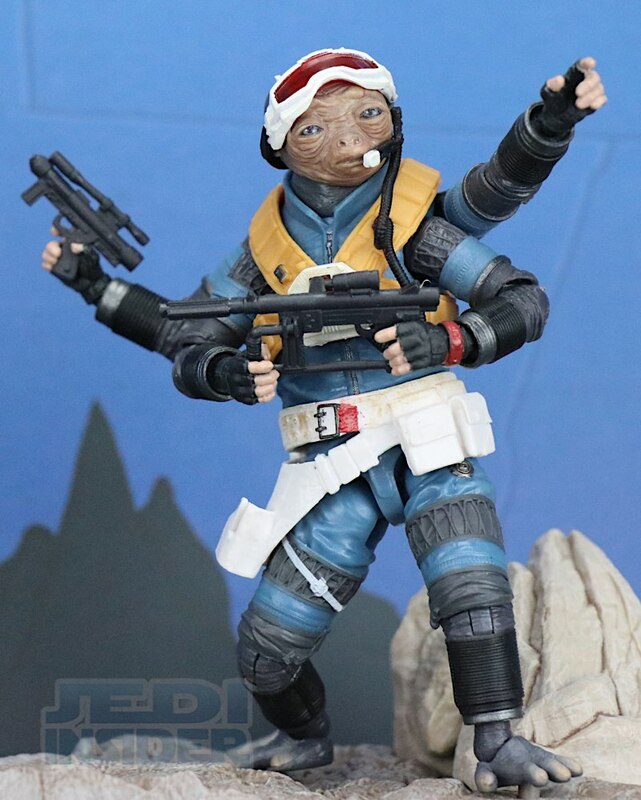 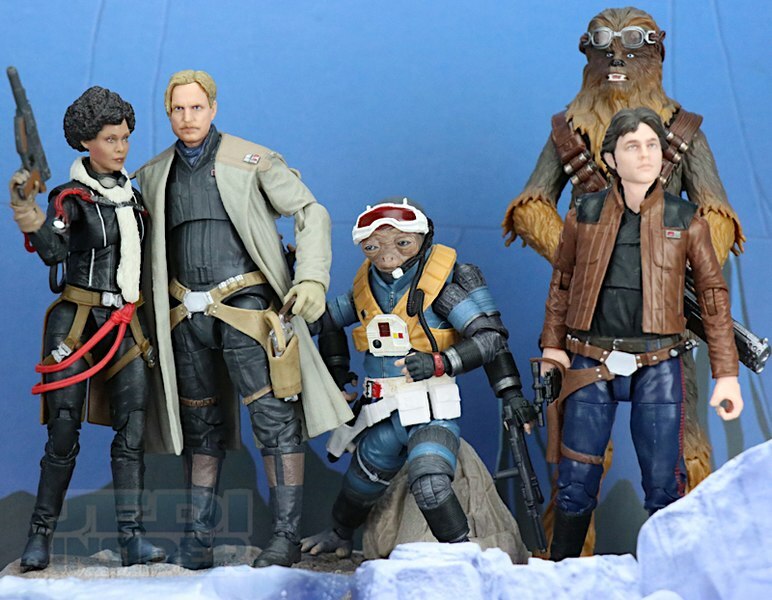 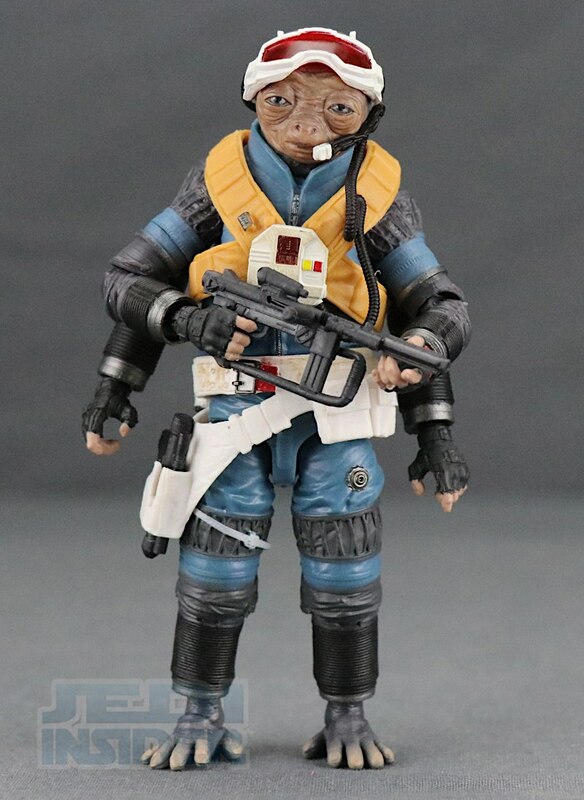 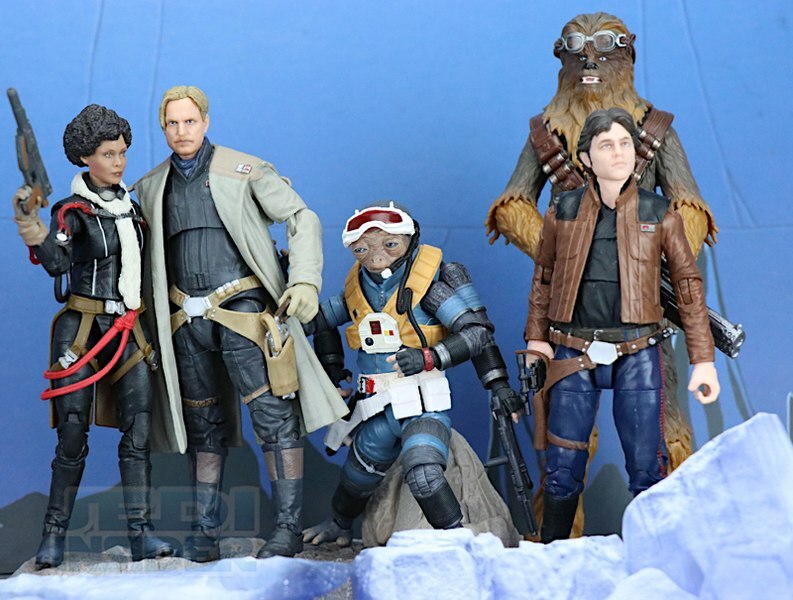 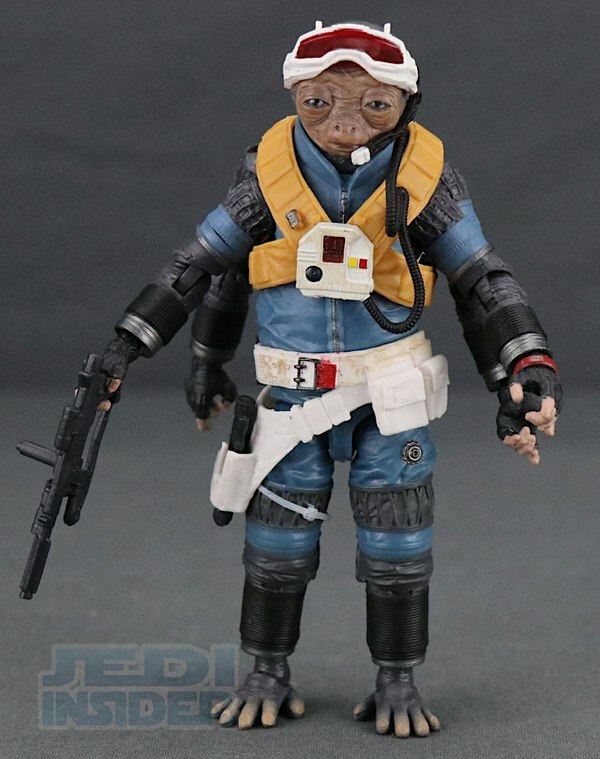 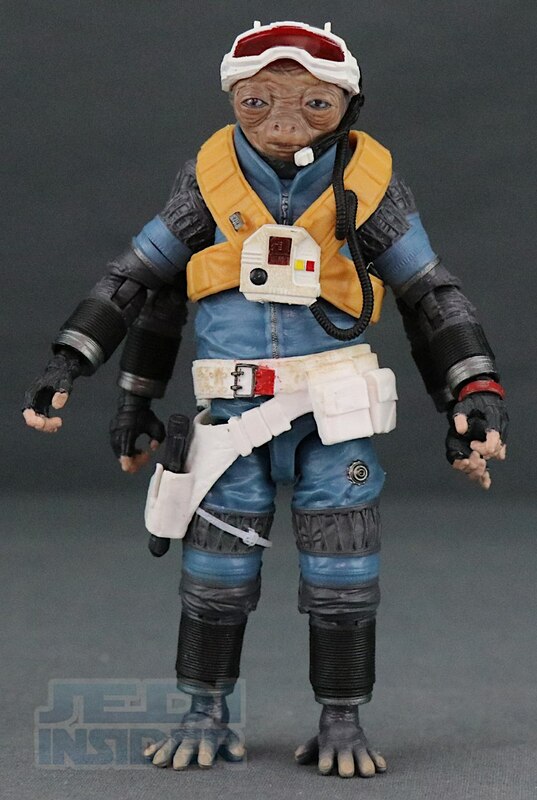 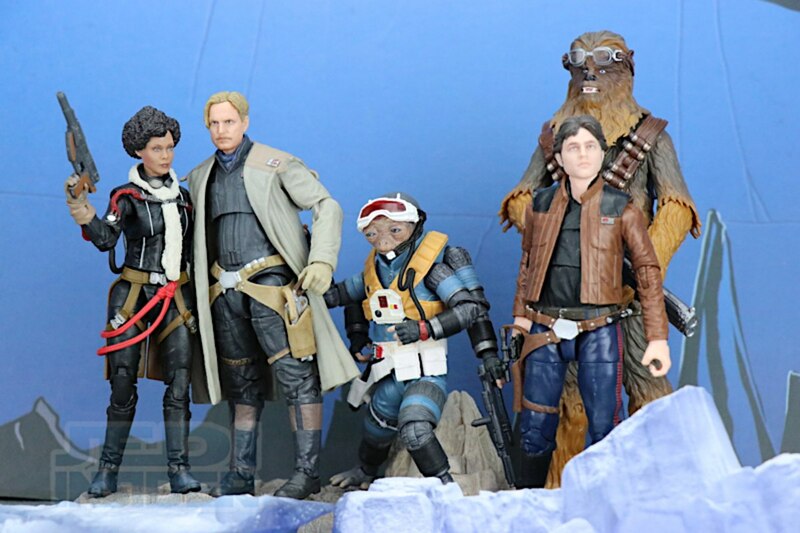 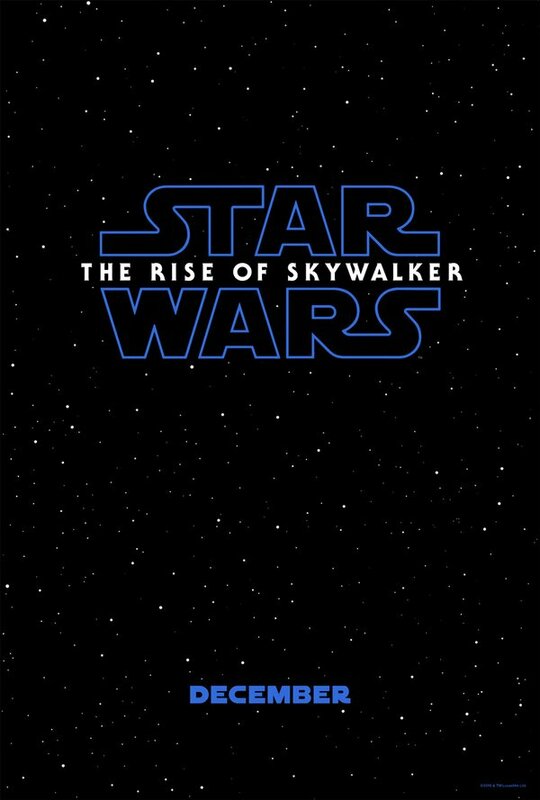 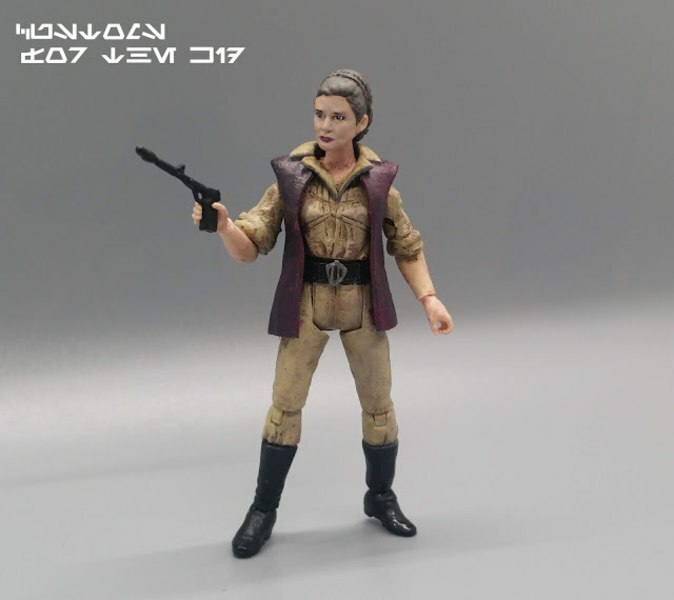 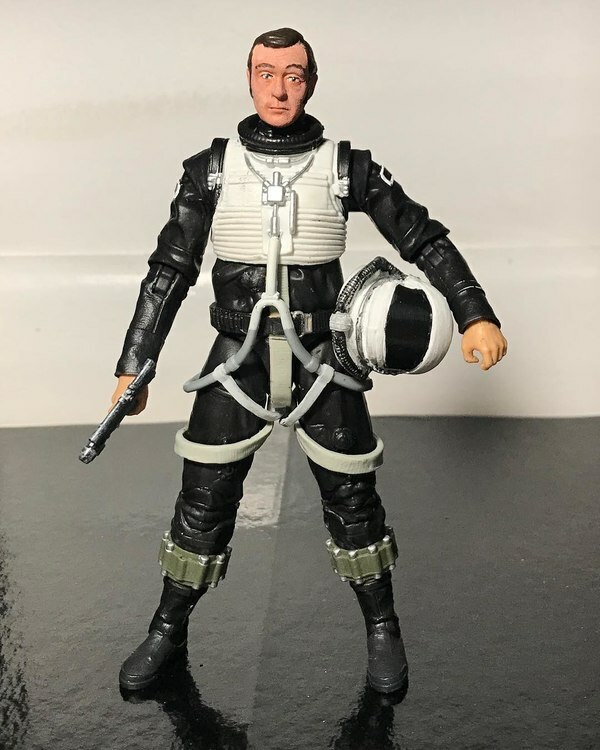 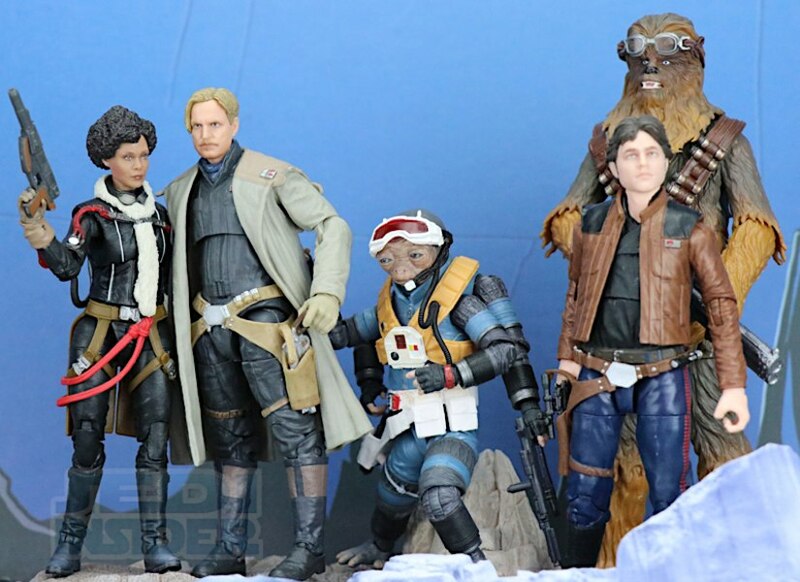 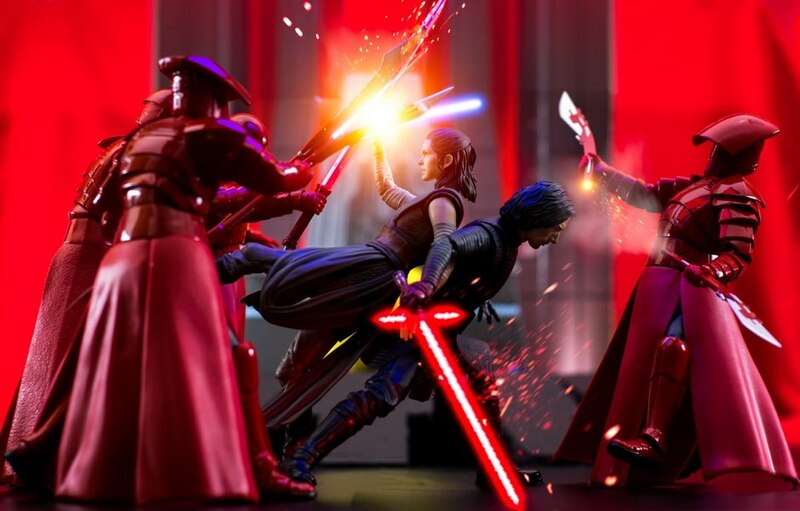 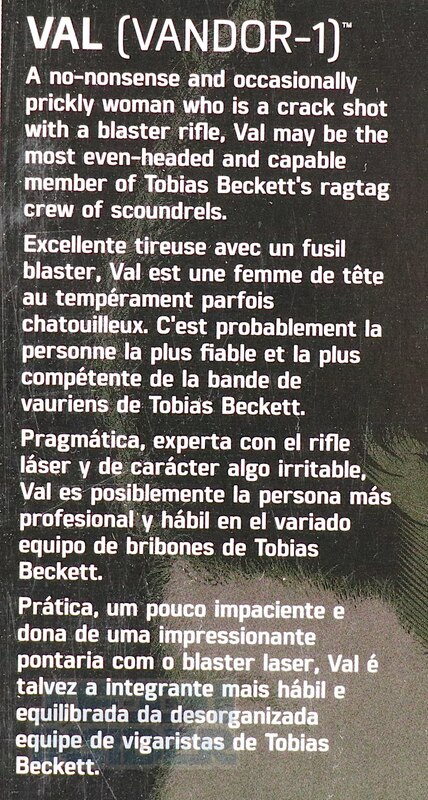 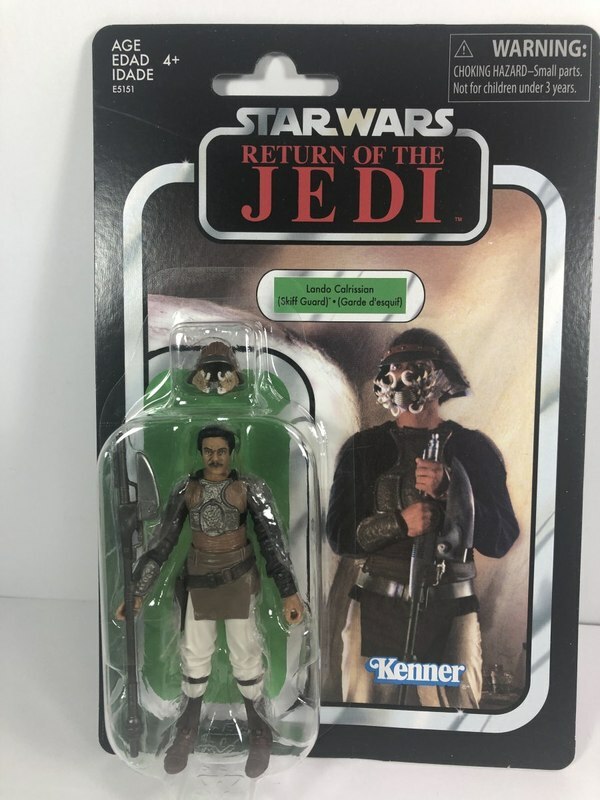 Hasbro continues to provide us figures based on Solo: A Star Wars Story for their 6" Black Series line with Rio Durant and Val (Vandor-1), both of which are members of Beckett's original crew. 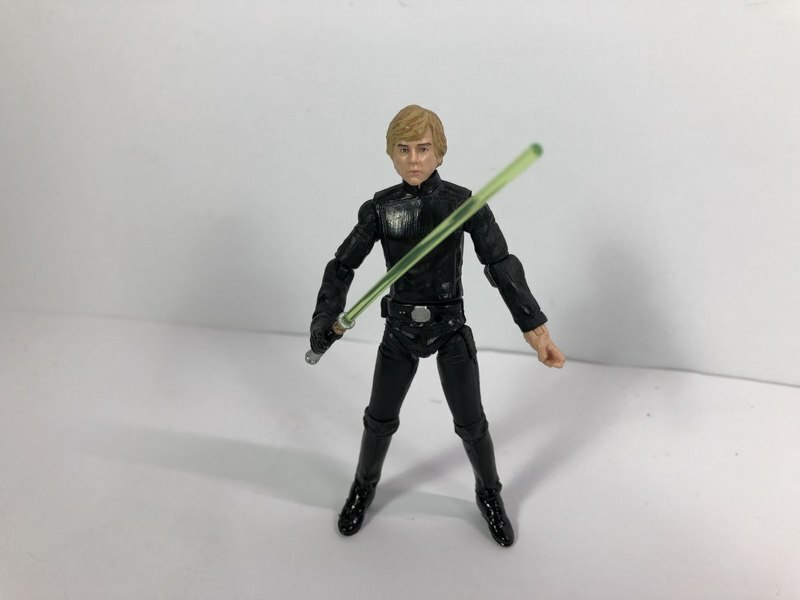 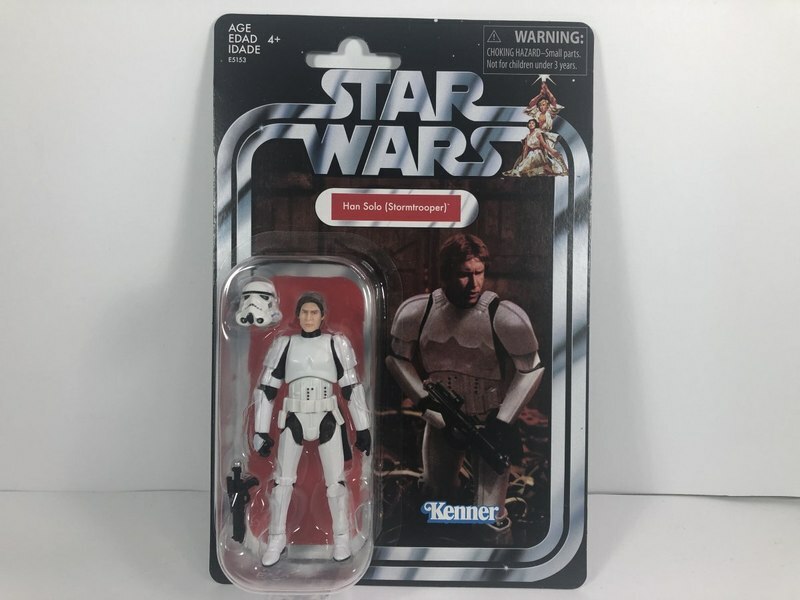 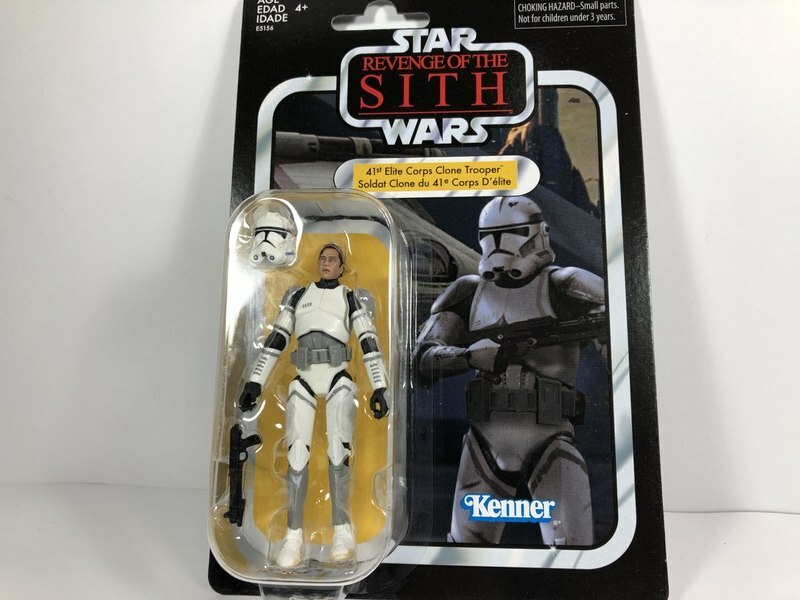 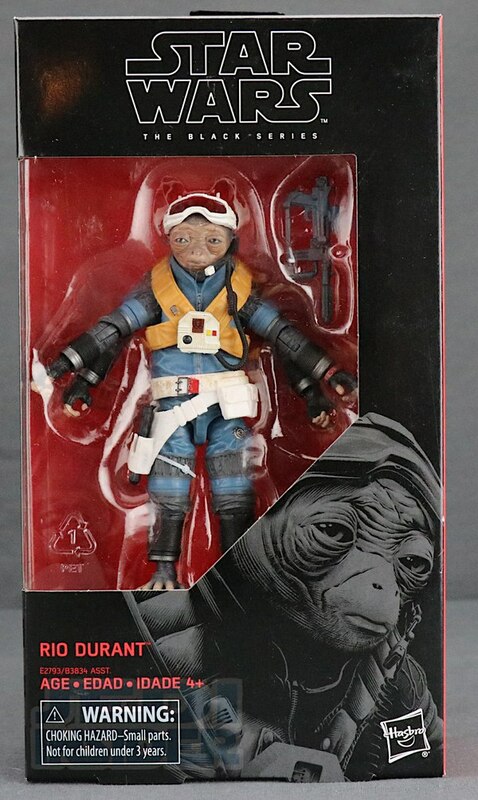 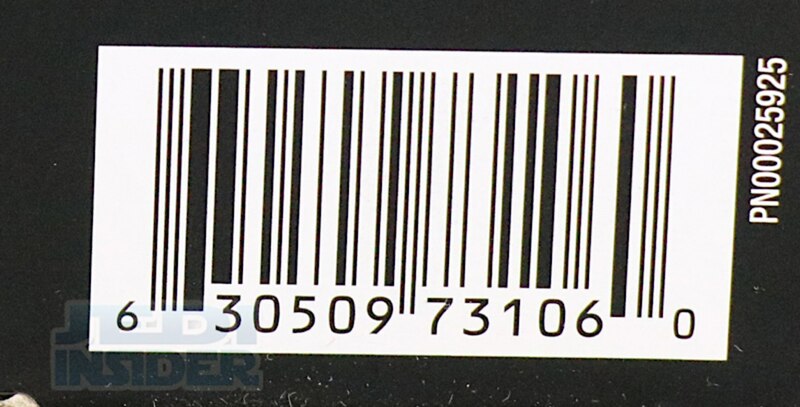 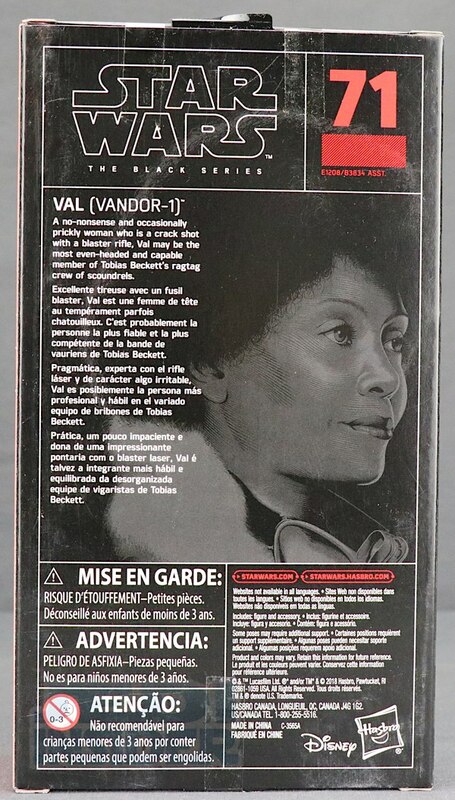 Both figures come packaged in the standard Black series style of window box with the black and red colors featuring a multilingual bio for the characters on the back. 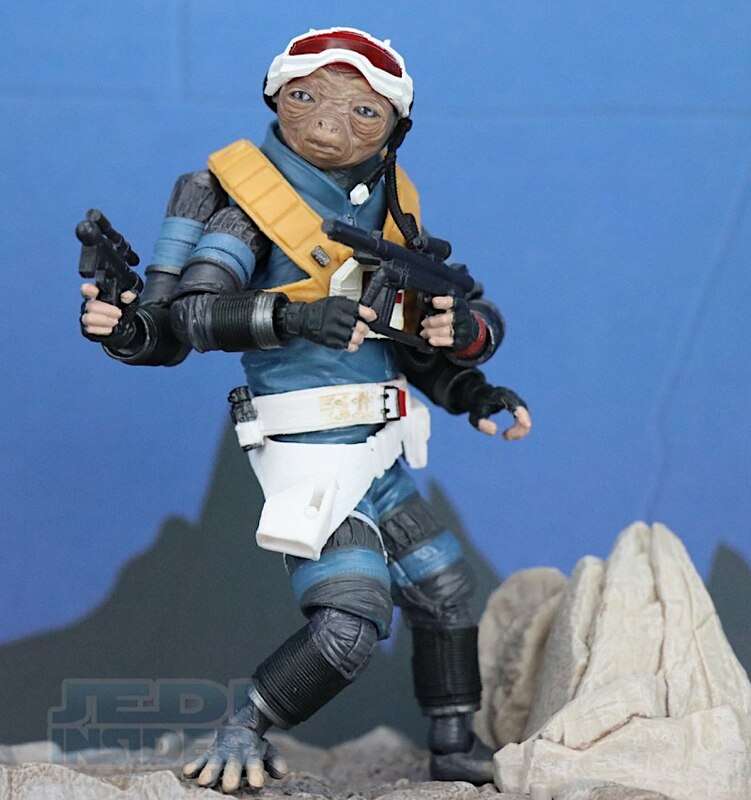 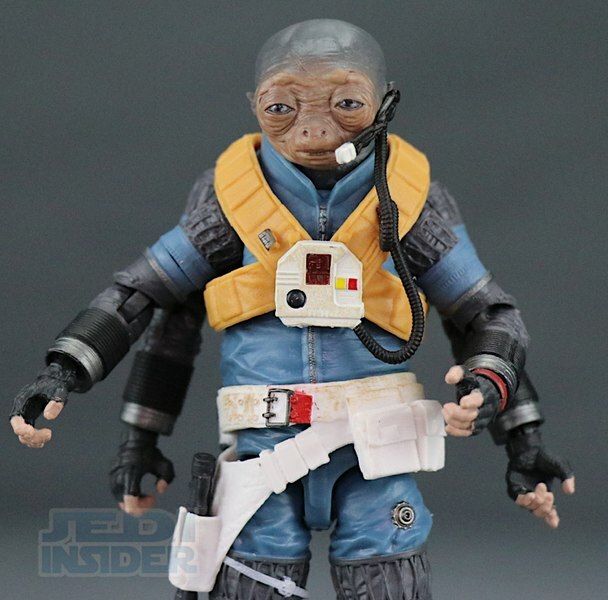 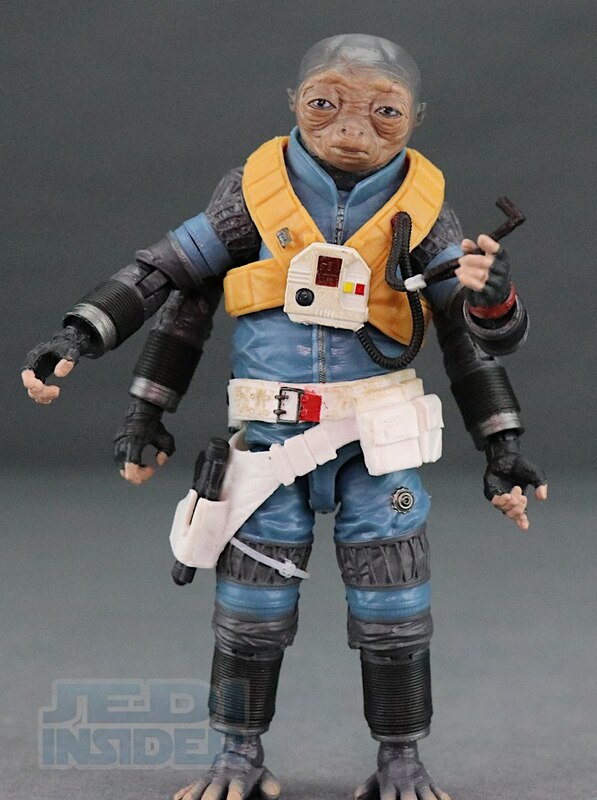 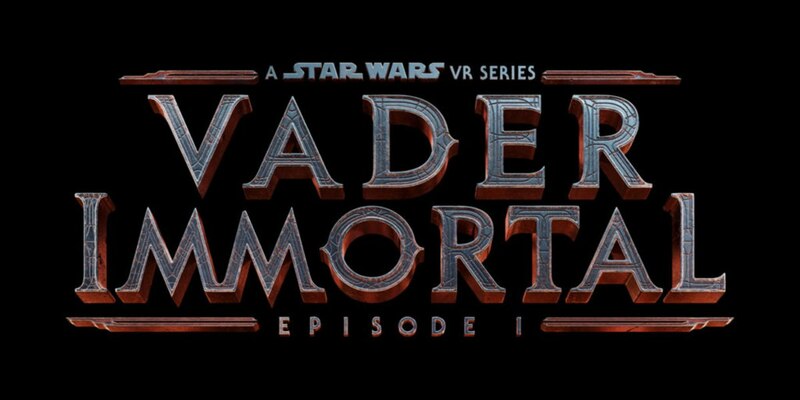 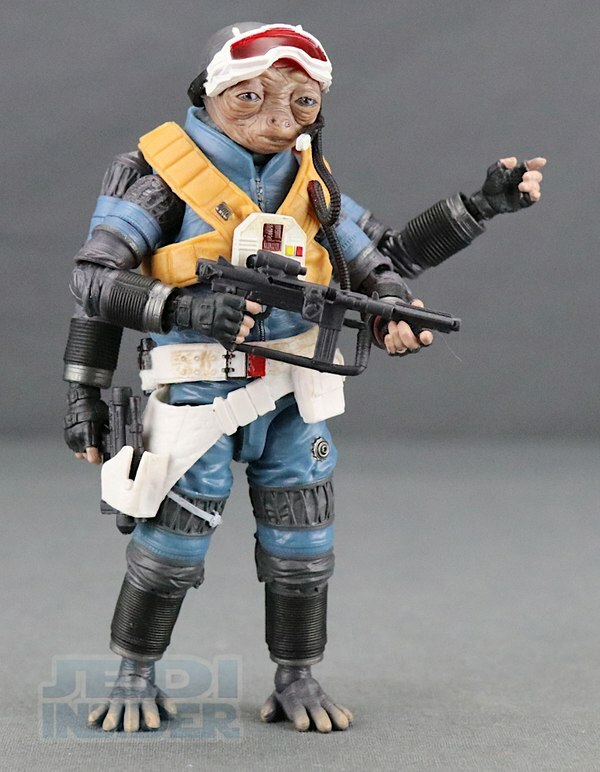 For accessories Val comes with a blaster similar to what you see her use in the movie and Durant comes with a pistol, rifle and removable googles. 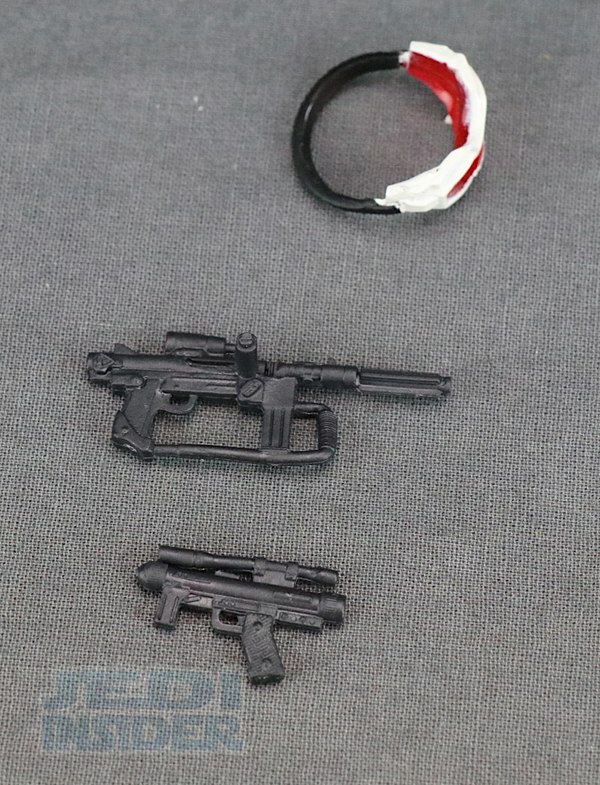 He also has a working gun holster for the pistol. 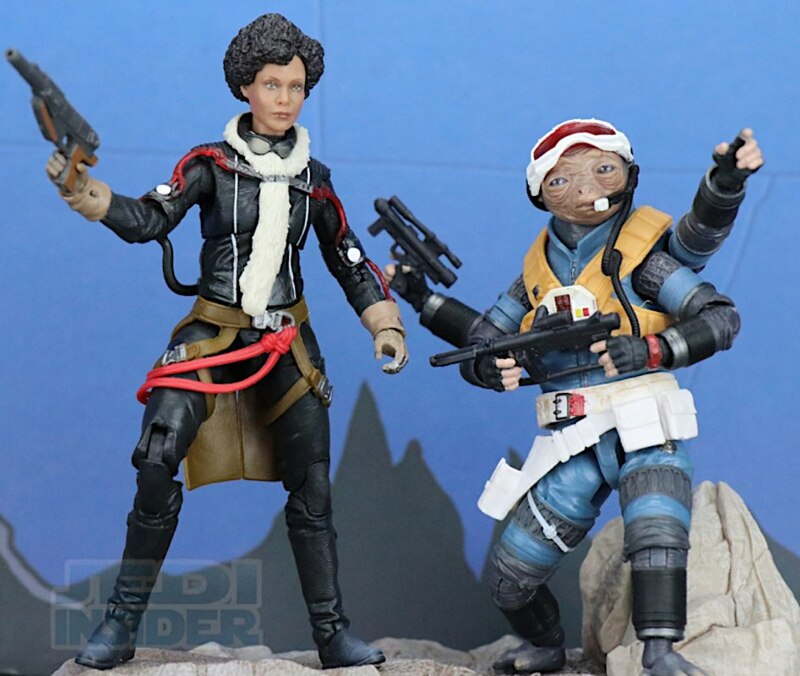 For the figures themselves, I think Hasbro has done a wonderful job capturing the likeness of both characters. 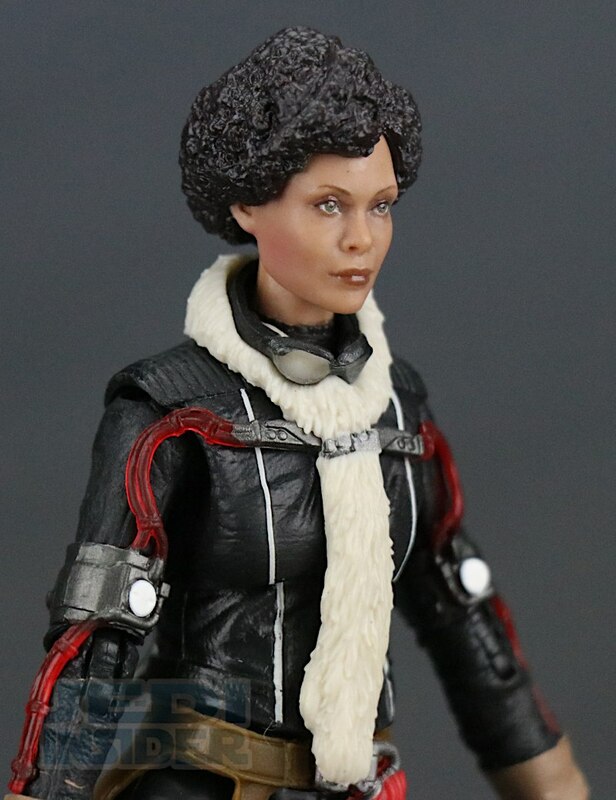 Val's headsculpt looks dead on to actress Thandie Newton who played the character in the movie and the paint applications are as good as any i've seen on a Black Series figure. 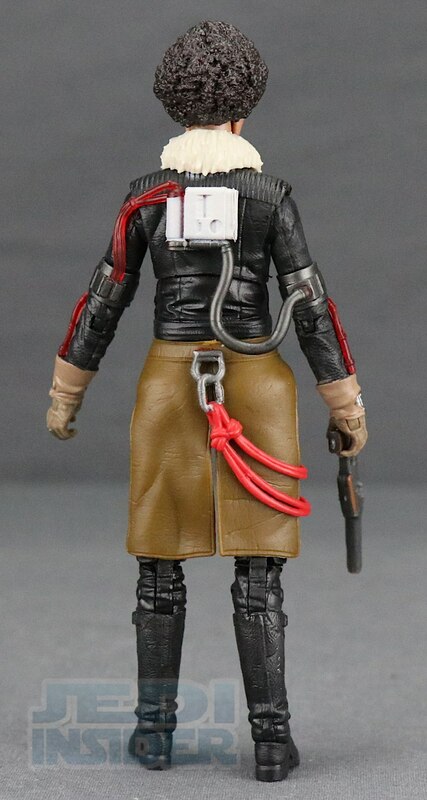 The outfit she wears is nicely detailed and I really like how the translucent tubing on her upper body and arms look. 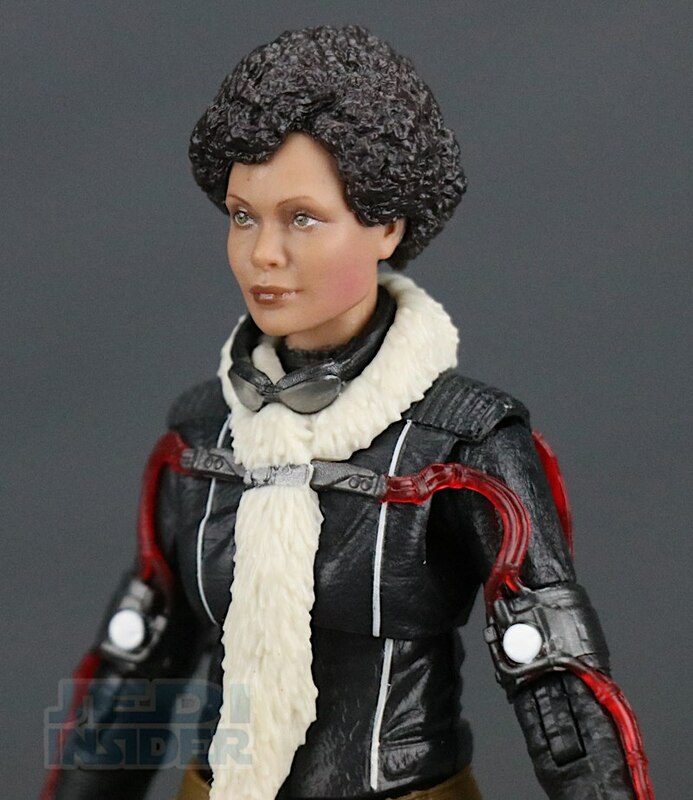 She has a pair of goggles sculpted around her neck but they aren't useable. 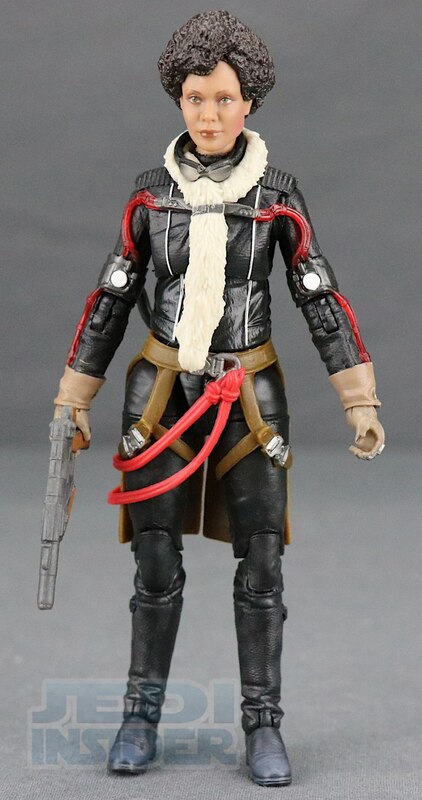 Other nice details on the figure include the sculpted fur around her neck that goes down the zipper-line of her jacket and the harness pieces that attach from her belt and go around here legs. 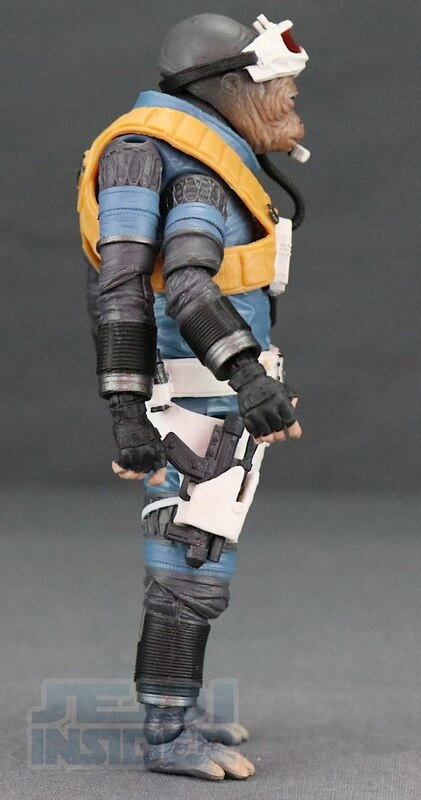 She has some tails from the coat made with a rubber vinyl like material that go down her backside to her knees. 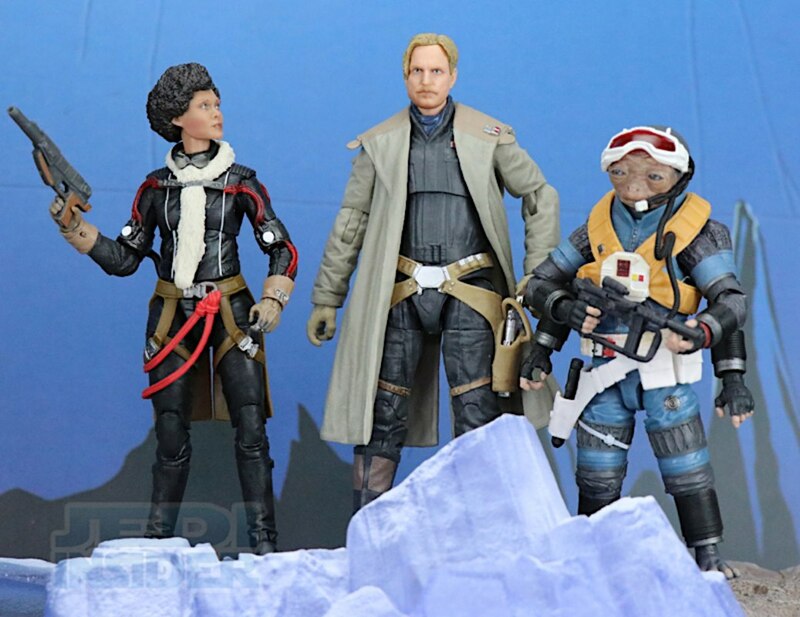 As good as Val is, I think Durant is who was voiced by Jon Favreau in the movie is the cooler of the two figures. 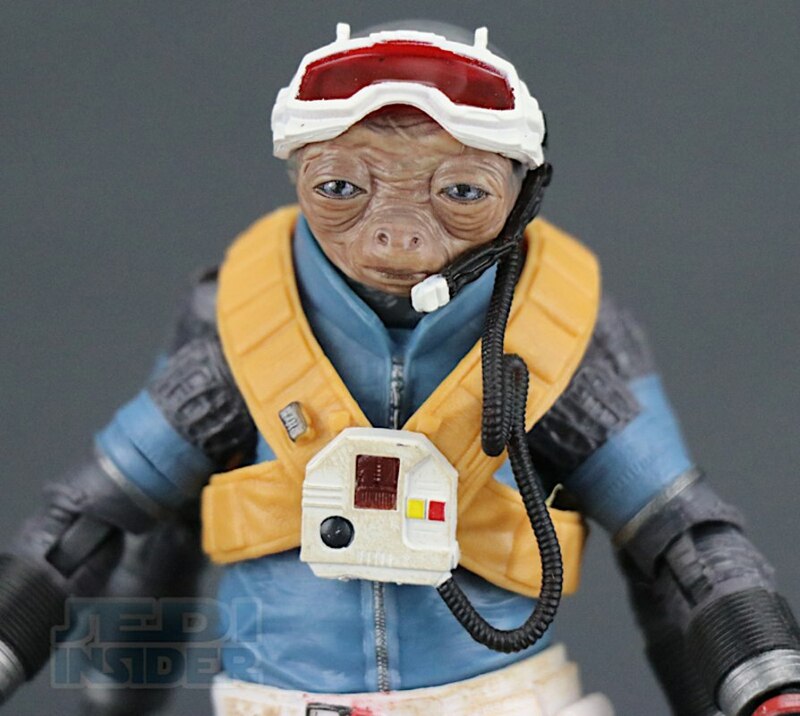 His headsculpt is also nicely sculpted capturing the alien look quit nicely. 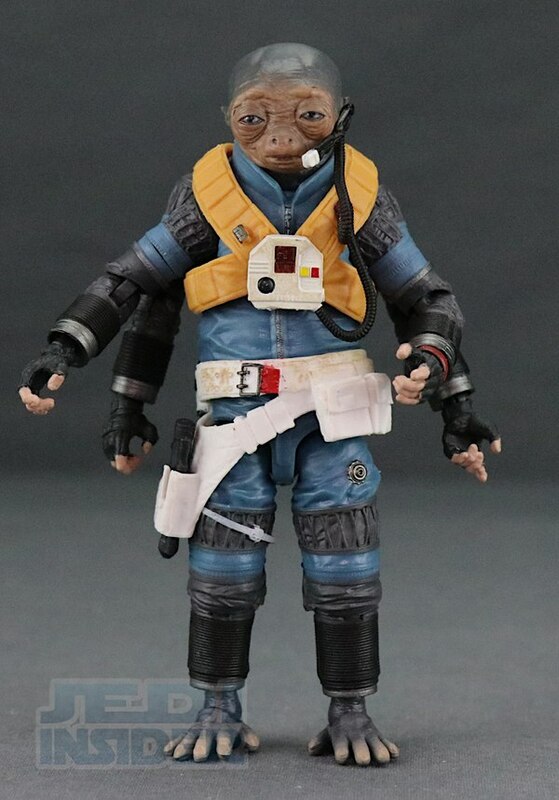 Besides the removable goggles with the red lenses, he also has a communication mouth piece which you can remove from his ear. 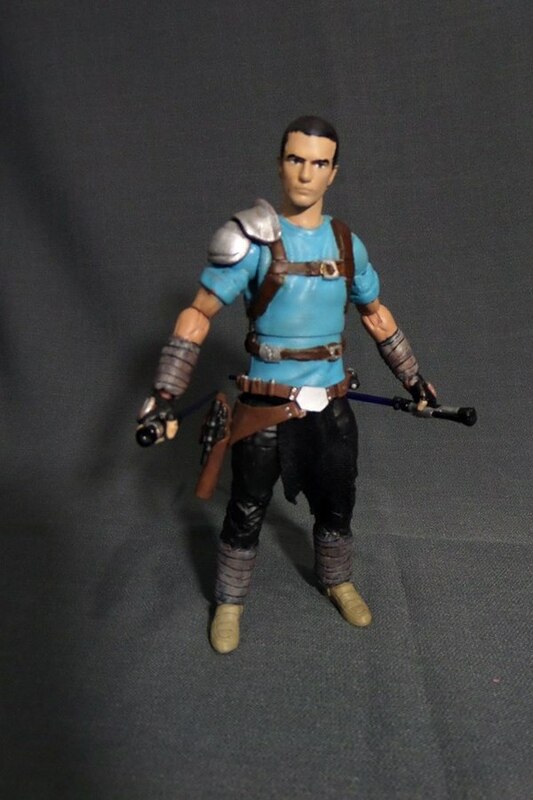 It attaches at the figures waist so it's not really removable from the figure itself. 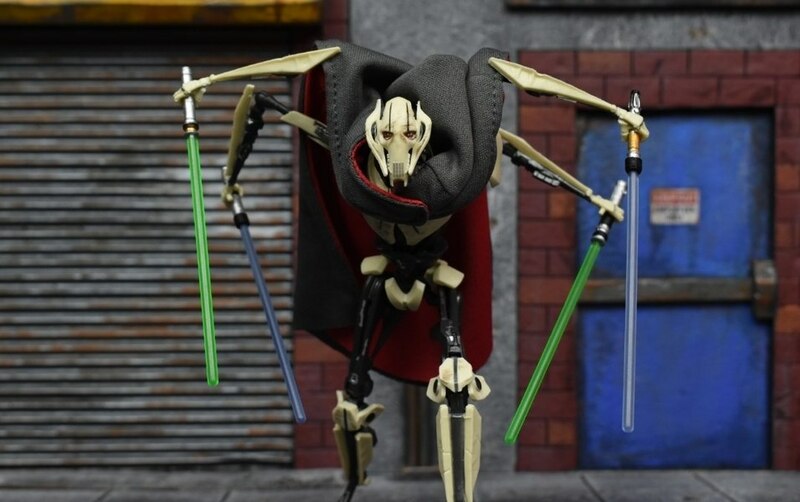 Durant features four arms all of which are articulated and work fairly well with the figure. 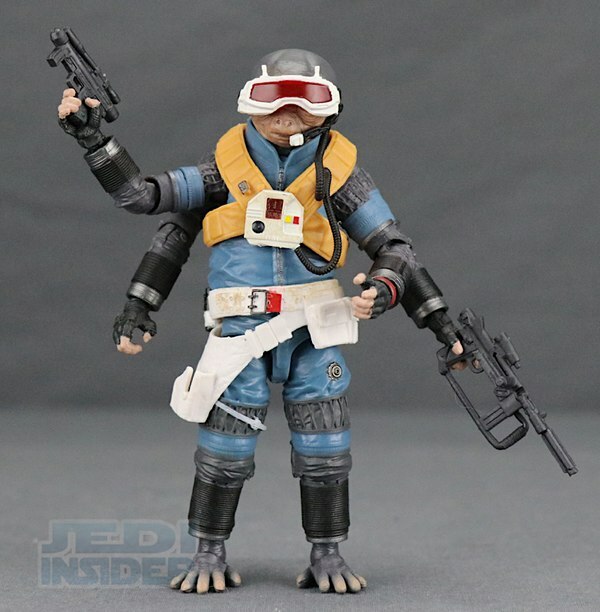 You can get him in multiple poses with the weapons he comes with which is nice. 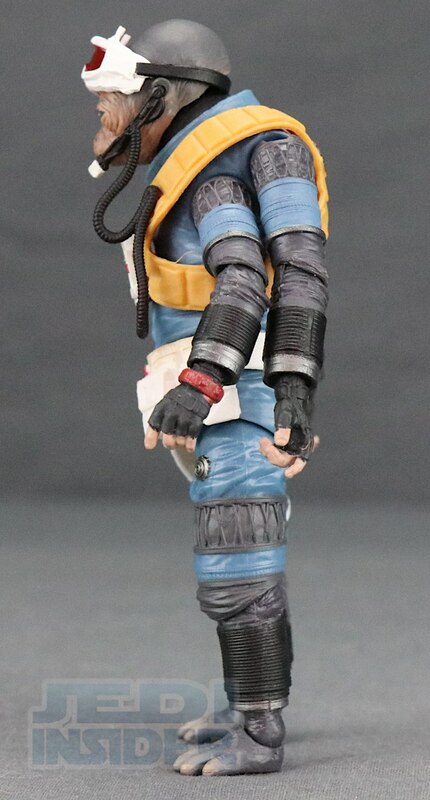 The jump suit he wears appears to be very movie accurate and I like the sculpting of his alien shaped feet. 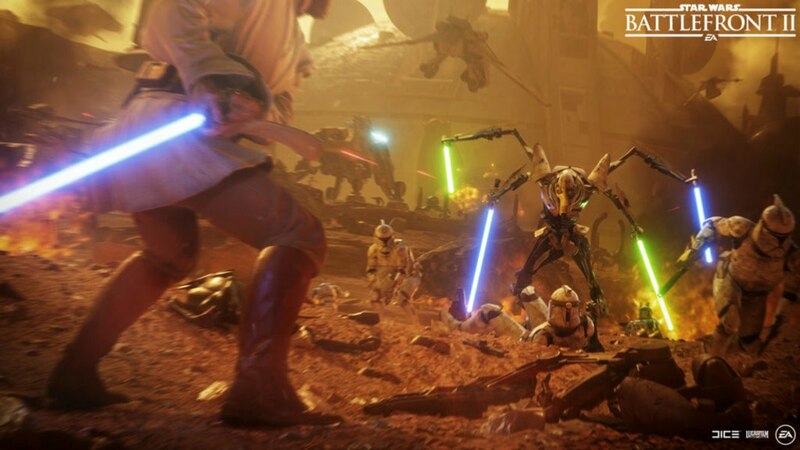 I think Durant is so cool in large part because he is such a unique looking character with the multiple arms and everything. 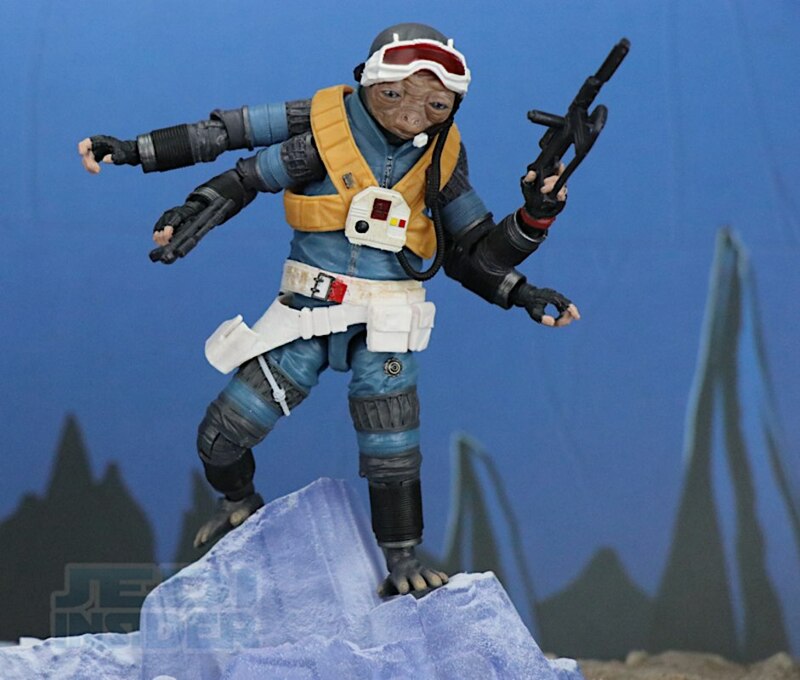 Articulation is basic on both figures, both featuring single-hinged elbows. 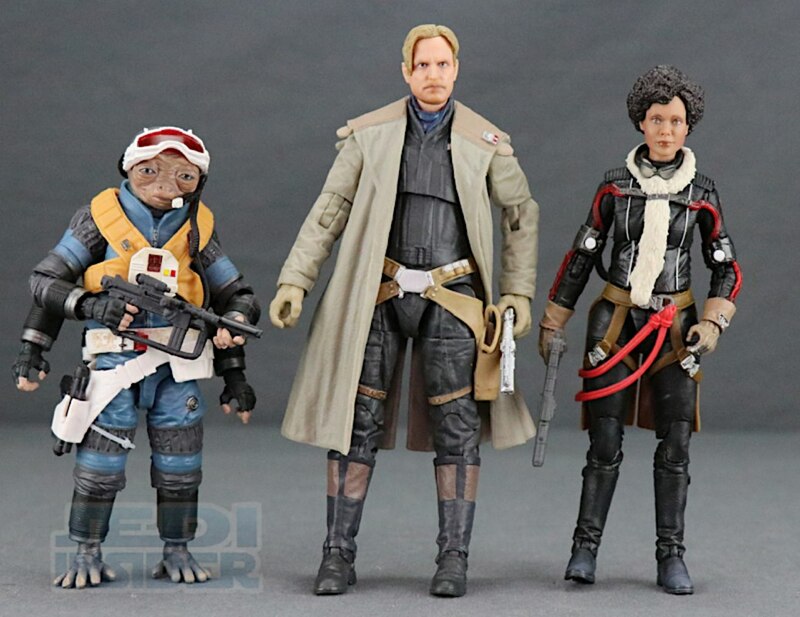 Val has double hinged knees while Durant only has single-hinged ones due to being a smaller character. 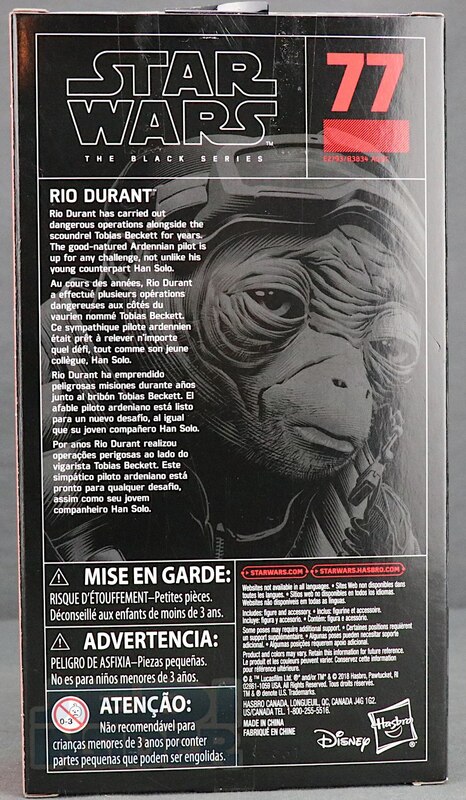 Despite having four arms, Durant also has some midsection articulation with rotation. 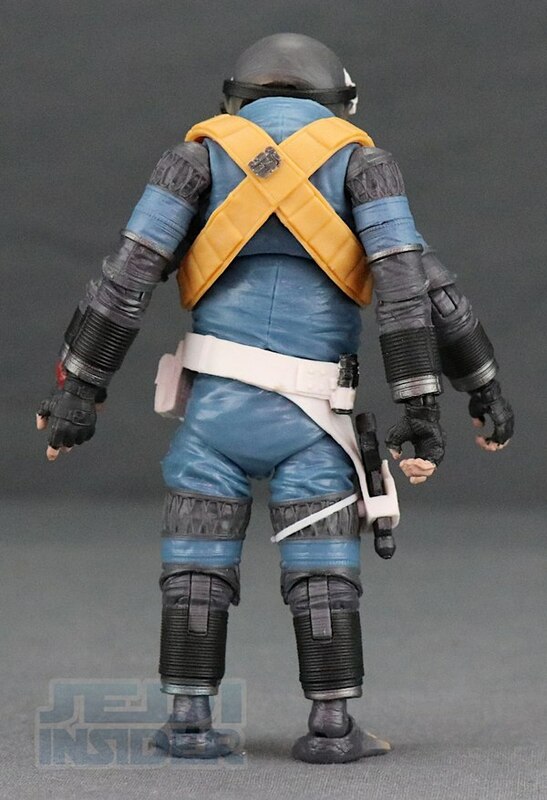 This is because the extra pair of arms are sculpted on the shoulders that stick out in the back. 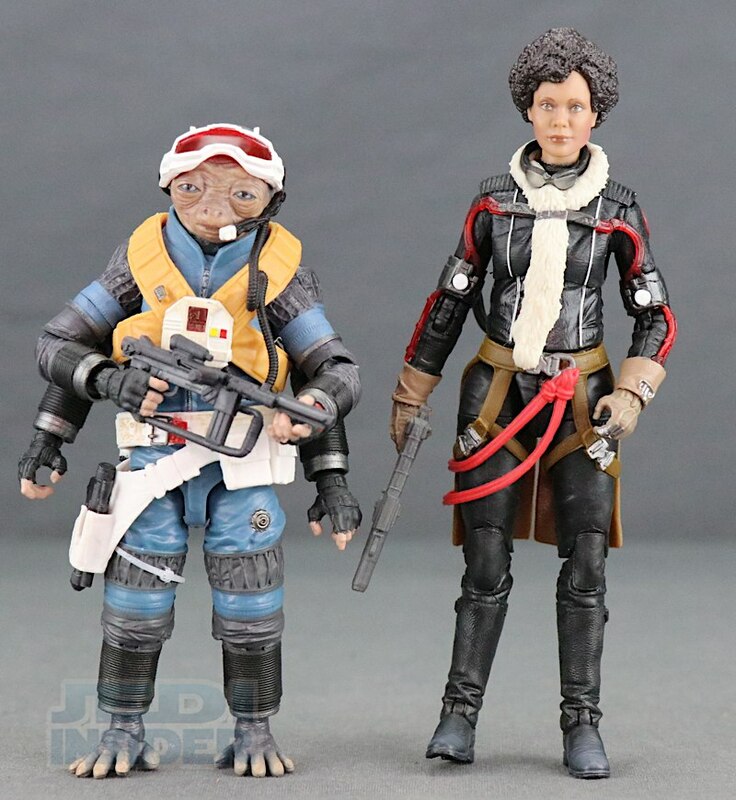 The scale seems to be decent when you compare these two with the other 6" Solo figures Hasbro has already released, so no complaints there. 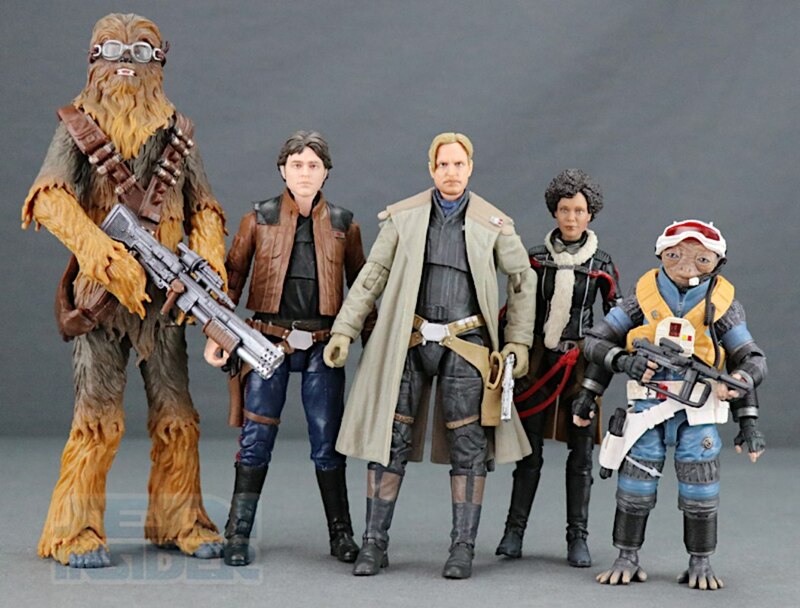 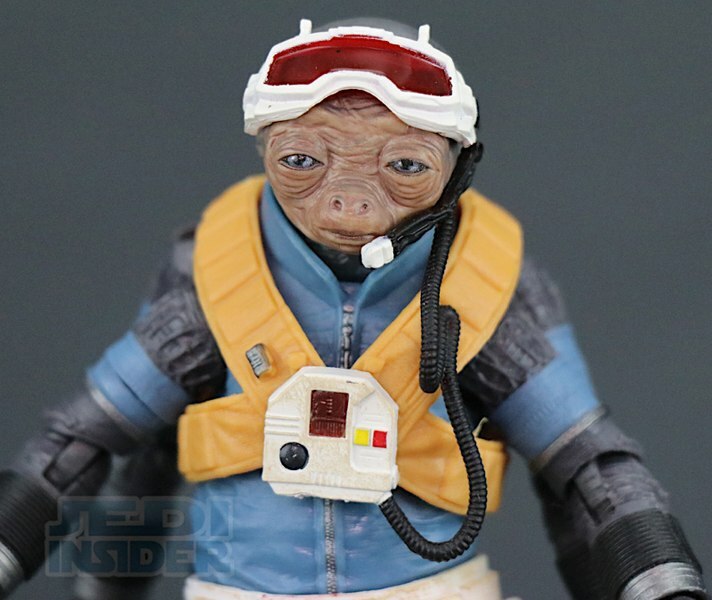 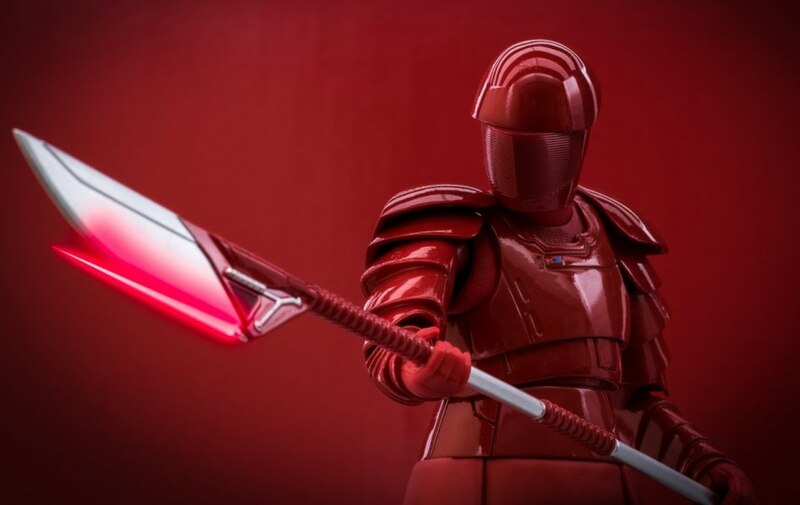 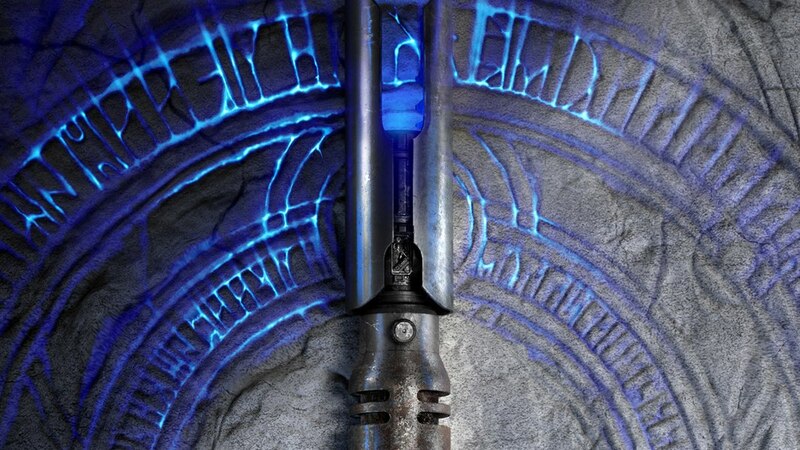 At the end of the day especially if you are a fan of the Solo movie and in Durant's case if you like unique looking alien figures, I think you will want to add these figures to your collection. 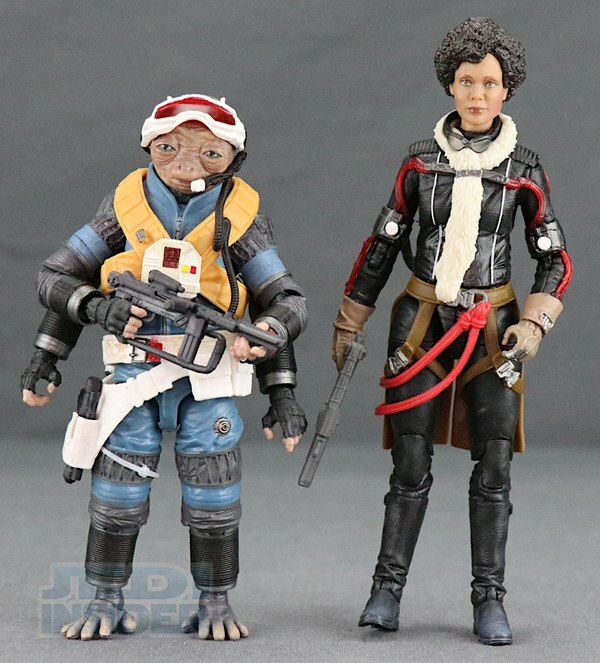 Both figures have started to see release. 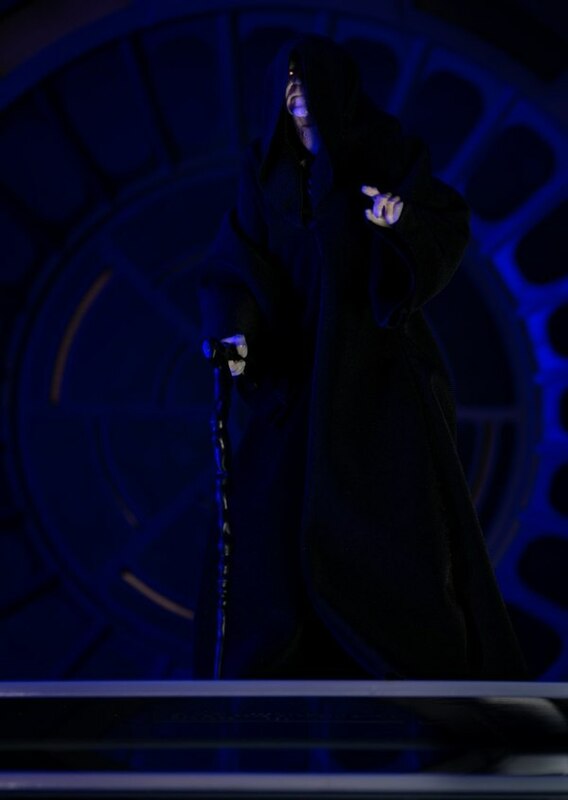 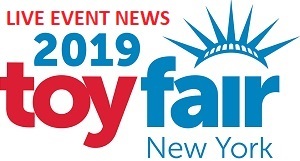 You can get them at our sponsor Megalopolis.Toys. See more images for both figures below and let us know what you think about them in the COMMENTS SECTION.